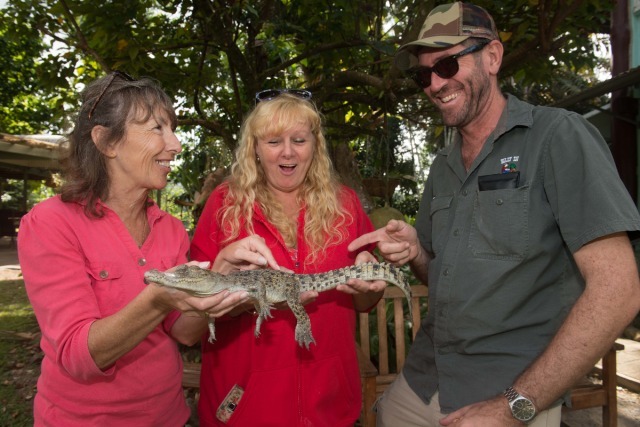 Billy Tea Safaris is a locally owned operator, which operates small personalised tours to Cape Tribulation. 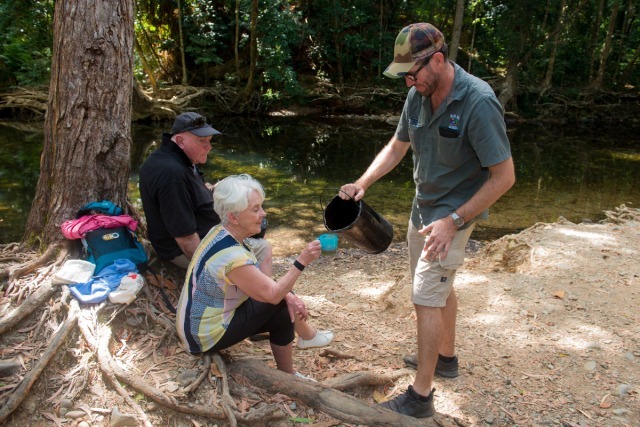 Your naturalist guides have extensive knowledge of flora, fauna, history of the area and aboriginal culture, which will ensure you day will be a memory of a life time. 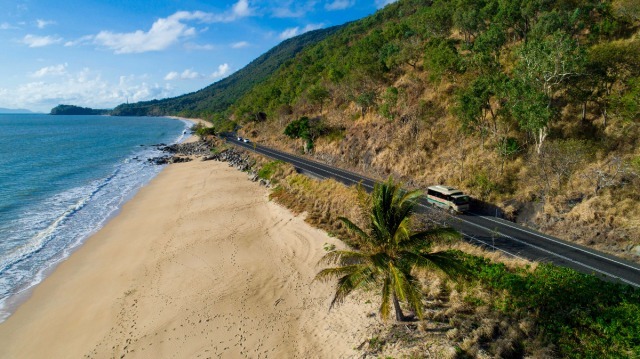 Drive north along the scenic coastal route along the Captain Cook Highway learning about the history of the area and admiring spectacular views of the coast line and Coral Sea. 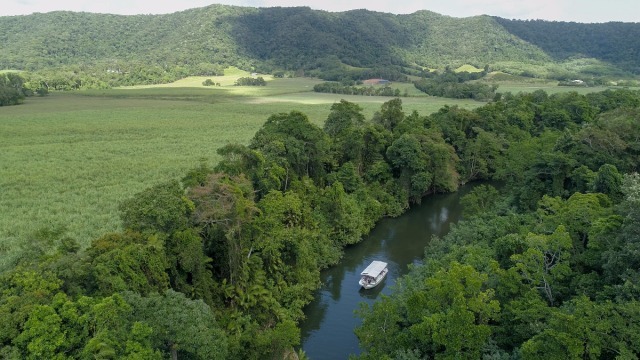 Stop at the Majestic Daintree River for Morning Tea before enjoying a guided River Cruise on the Daintree River. 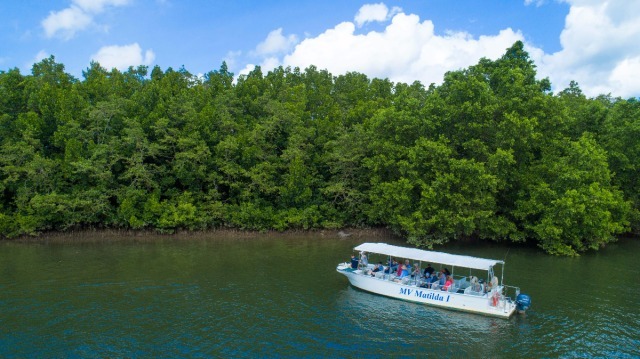 Learn of Estuarine Crocodiles, mangrove forests and endemic wildlife. Ascend the Alexandra Range and pause for a panoramic view of World Heritage Rainforest merging with the azure colours of the Coral Sea. 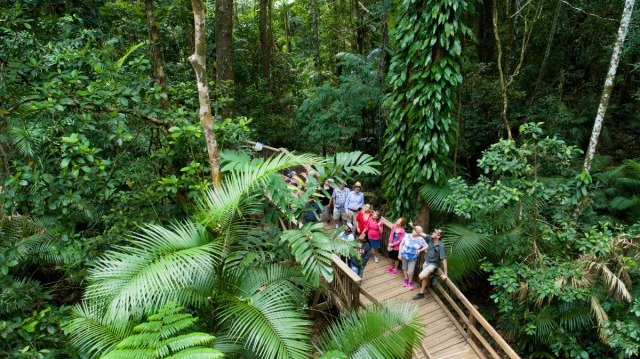 Experience the rainforest on one of the guided elevated Boardwalks. 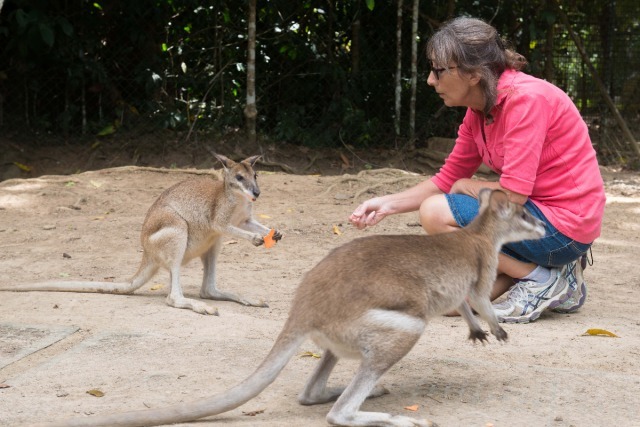 Travel onto Lync Haven animal refuge where you have the opportunity to hand feed a kangaroo and get up close to some of Australia’s wildlife. 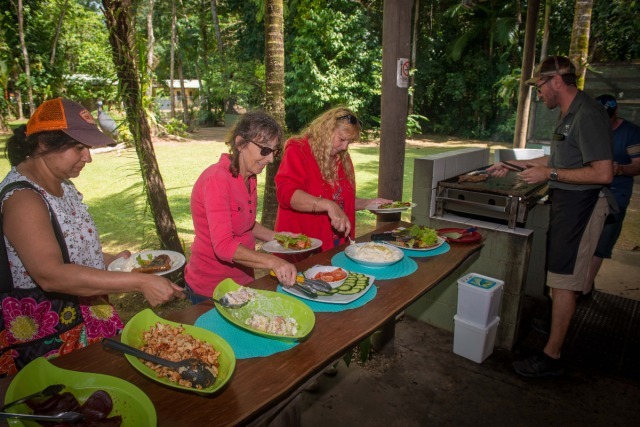 Enjoy a gourmet barbecue lunch with freshly prepared salads in a beautiful rainforest setting restaurant. 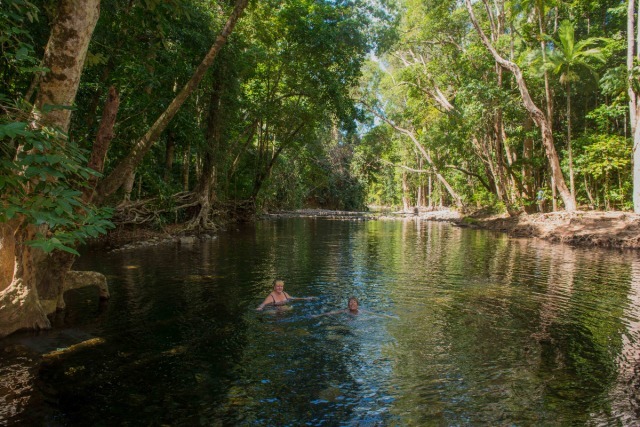 Travel through spectacular Rainforest as you pass Cape Tribulation and continue along the 4WD Bloomfield Track through to Emmagen Creek. 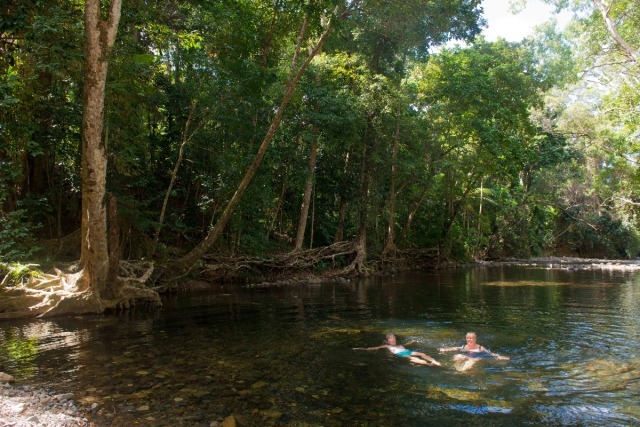 Time for a refreshing rainforest stream swim, in crystal clear freshwaters. After a short afternoon refreshment stop, cross the Daintree River by cable ferry and begin the homeward journey. Please Note: This tour runs in reverse occasionally. The day started at seven am with our pick up. Our driver-guide, Chris, met us and introduced himself and our vehicle, Wombat, to us. We then zipped around the city and up to Palm Cove picking up the rest of the group. Chris would introduce everyone as they hopped aboard Wombat and by the end of the first stage of the day there were eleven travelers who came from Australia, Japan, Italy, America, and Britain. What a varied group of travelers we were. From the very beginning Chris informed us of the history of the area and the natural world that it is made up of. We learnt that Cairns was founded as a port in 1876 to transport the materials being logged and mined in the surrounding areas to their final destinations. In fact Chris was a babbling brook of information for the whole journey. At every point he was able to paint a picture of the history, both European and Indigenous, fill us in on the industrial concerns, tell us about the plant and animal life and even include up to date comments on the politics relevant to our landscape. This made the tour far more than an eleven hour scenic drive because we gained an appreciation for the area that went beyond aesthetics. And how pretty this part of the world is. From the moment you pass Palm Cove and leave the last fragments of Cairns' creeping suburbs, nature begins to have its 'way with you'. For half an hour we wound up along the coast road towards our first stop of the day, Mossman. To our left we had hills and trees and to our right we had the ocean. We picked a good day to take part in the tour as rain could be seen before and behind us while we were untouched. And that made the views all the more interesting as we got to see the two sides of the area, the blue skies and perfect weather of the brochure and the wet that allows the tropics to survive. In Mossman we hopped out and stretched our legs next to the magnificent Jamaican raintrees. Chris shared some information about how the trees got to be in Mossman and the church that sits underneath their branches. He also gave a nice overview of Mossman's lifeblood, the sugar cane industry. And it was when he was doing this that another advantage of choosing Billy Tea Bush Safaris to see the North came through; our other travelers began asking questions. The tour was personal and interactive because although we were going to set destinations our opportunity to learn about the area was only limited by our curiosity. 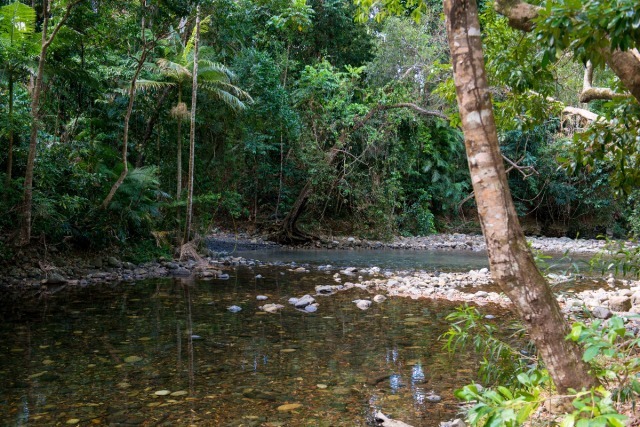 Our next stop was at the Daintree River. Here we had our first smoko, tea and biscuits, before hopping onto a boat for a river cruise. Our guide for this section was a man called Bill. Like Chris, Bill had a thorough knowledge of his surroundings. 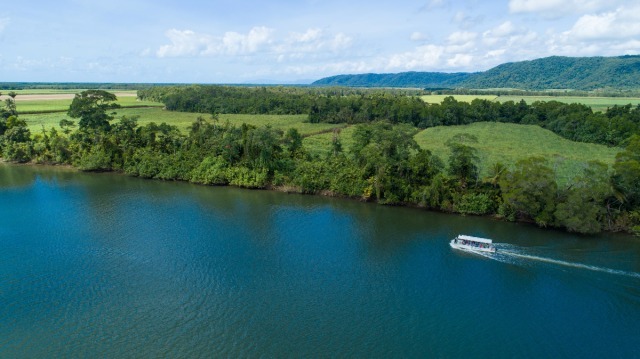 As we cruised along the banks in search of crocodiles, snakes and birds Bill informed us of the history of the area while using his keen eye to spot wildlife. 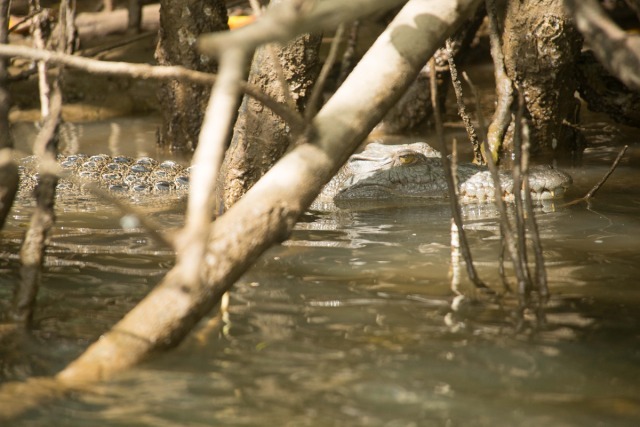 We were fortunate to see crocodiles raging from nine weeks to six years in age as well as two types of snakes and a beautiful Azure Kingfisher. Bill's humour was as keen as his eye he managed to throw in as many jokes and puns as facts adding to the enjoyment of the cruise. After the boat ride we were ferried across the river and into the Daintree Forest. 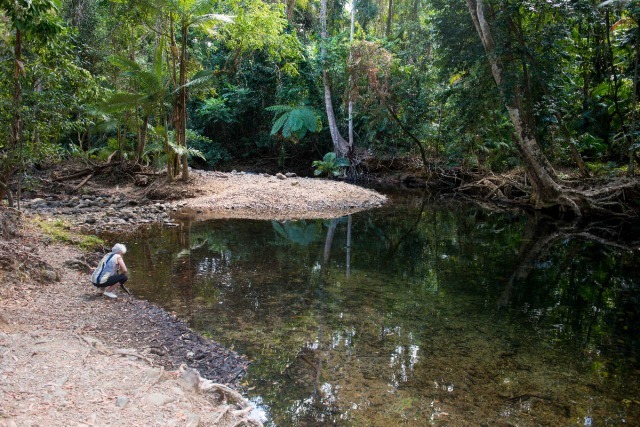 This was my fifth trip to the Daintree and the beauty of the area always humbles me. What was different about this journey was Chris' commentary as it managed to increase my sense of fascination and awe. We were informed that we were now traveling through the oldest rainforest on Earth and that within this World Heritage area the most primitive plant life on Earth can be found. We were literally within a cradle of life. We booked this tour through travstar. We received great service from travstar and the tour was fantastic. Terrific day out! Very professional but friendly guide who gave us all the information we needed to enjoy and understand the places we visited. Tasty lunch was most appreciated. So glad I chose this small group tour. Had a lovely time and the driver was very helpful and friendly. I would definitely recommend this trip. Thoroughly enjoyed our tour into Daintree Rain Forest. Very well organised and fascinating and informative commentary on route. 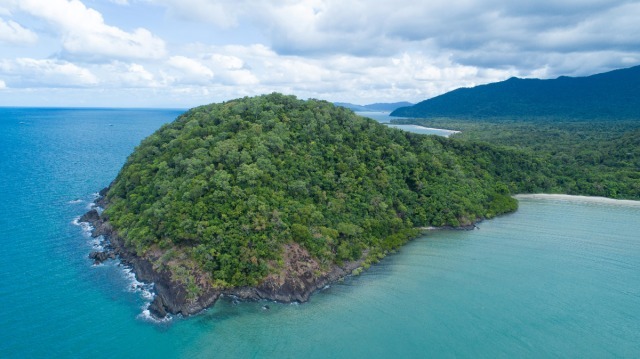 I just recently travelled with Billy Tea and had a wonderful time exploring the magnificent Daintree Rainforest and Cape Tribulation. The guides, Matthew and Mick were fantastic and very passionate about the area. 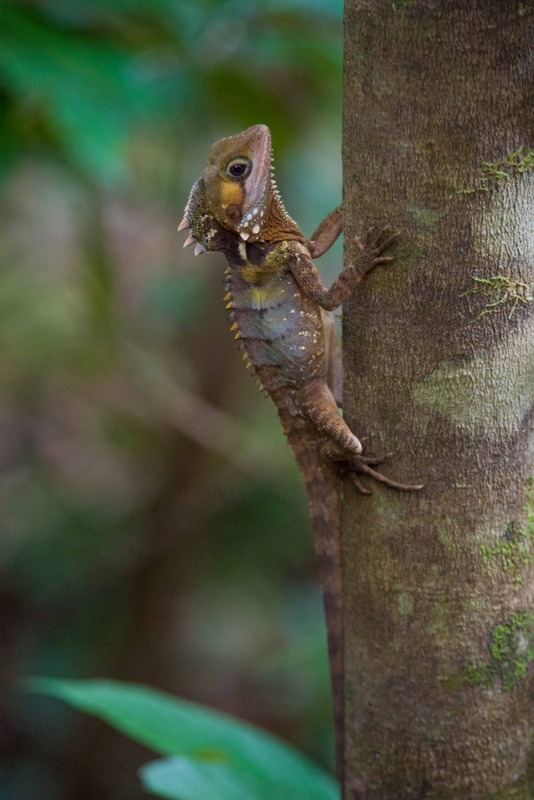 We even saw a Cassowary and a chick, Boyd's Forest Dragon, a 4 metre crocodile and lots more. The tropical fruit, damper and billy tea was a nice touch by Emmagen Creek. 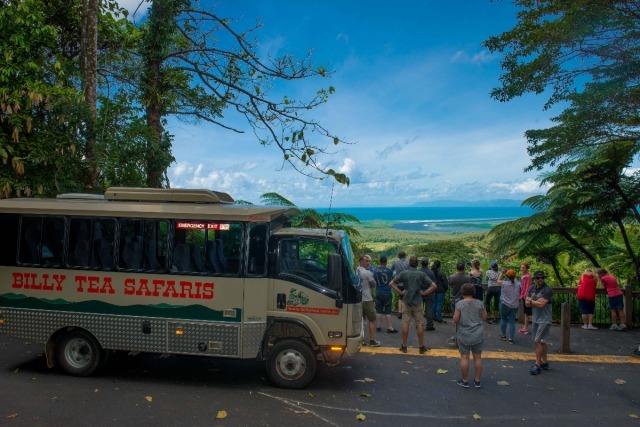 Will definately recommend others to do this tour if you are thinking of travelling to the Daintree and only have a day to do it! Very informative and enjoyable experience. Very well organised, very informative and enjoyable experience. Our driver/guide was great - he shared his extensive knowledge about the area in a very interesting narrative during the trip. 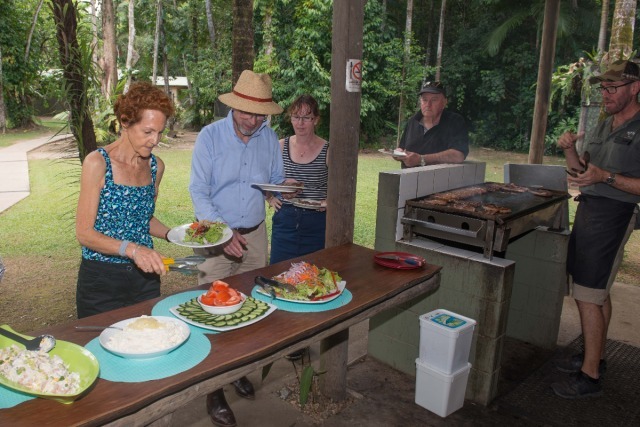 Learned a lot about the Daintree trees and loved the tropical fruit and billy tea with damper at the freshwater pool. Our river trip was also interesting and our driver was most considerate and experienced. Plenty of good food at our lunch stop too. We much enjoyed the day out, swimming especially. Mark and Brendan worked extremely hard to make it a success. Thanks to them. Excellent daytrip up to Cape Tribulation via Port Douglas and Daintree. Long day but well organised with morning/afternoon tea and a tasty bbq lunch. The dip in Emmagen Creek and the ice cream stop topped off the day. Well worth it. Thoroughly enjoyed the day, especially the swim at Emmagen Creek. The day with Billy Tea was a great experience. We really enjoyed our driver/guide, Cathy, who was a great source of information along the way. She grew up in the area where we traveled so that was an added bonus. Kathy was a wonderful tour guide and her knowledge of the area, customs and history made the tour very interesting. Lunch was great too! It was a great day thoroughly enjoyed the trip!! This was a really informative and educational trip - we got so close to wildlife that we will probably never experience again. The guides were very knowledgeable. It was great fun - great value. Took care of us very well and felt that we had almost a private tour of the sights. Very good and knowlegable guide. I had an awesome day and the tour guide was great! Would recommend it all over again. Tourguide(s) were very competent and good fun. Would recommend it all over again. We really enjoyed our trip and found Mathew a wonderful guide. The rainbow in the rain forest tours. Thanks for a wonderful tour. We had a wonderful host named Fin who made the experience special. Great trip highly recommended. The tour bus & guide were brilliant.The guide provided lots of relevant information and local knowledge. Very good. Great variety. Finlay as a guide was excellent. Good choice by Natasha. It would be better if provide spray when enter into the rain forest. Very entertaining tour. Tour guides very friendly, educated and informative. Recommend it is a must do on a trip to Cairns. It was fun and we gain knowledge about plants and animals! It was fun and we gain knowledge about plants and animals! It was awesome to swim in the lake and try the tropical fruits and Billy tea! Would definatley recommend this trip! A fantastic day with Matt our guide, on time pick up good comfortable vehicle for the day, good food at BBQ lunch and enough stops during the day. Would definatley recommend this trip, thanks Matt. Had a really great time worth the trip. Had a really great time worth the trip. Very nice staff well looked after well worth it. Thouroughly enjoyed the tour. A great day out,well run, well organised, I would highly recommend to anybody. Busy day with lots to see and do. Great BBQ lunch and guide was very fun and informative. Busy day with lots to see and do. Our guide Matt was entertaining and informative and will highly recomend the tour to friends. Good day, our guide name was Flynn and was very knowlegable about all the areas we visited. Any one wishing to get a brief understanding about the rain forest this is a good trip to take. The lunch and snacks supplied was very good. A very long day out but very worthwhile. Our driver and guide was full of information and did a great job all day. 'Quality of Facilities' only gets a 'Good', the reason being that it was in the middle of the Tropical Rain Forest for God's Sake! The reality is that 'Everything' about this trip was 'Excellent'. John our Guide/Driver was knowledgeable without being over the top in terms of facts or figures and his laconic sense of humour was a bonus. My wife and I, both in our seventies, got so much out of the day. 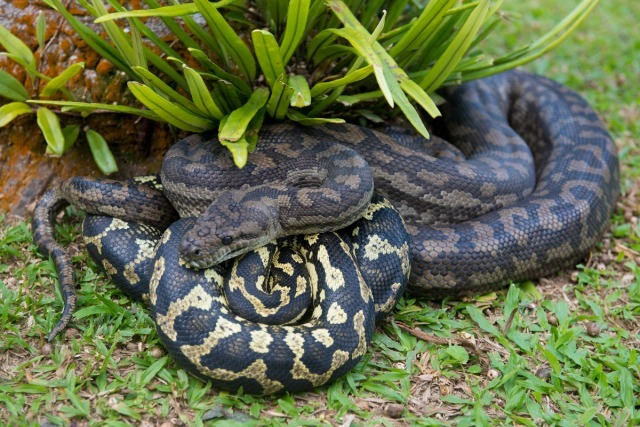 We saw snakes sunbaking on tree limbs overhanging the Daintree River, Kookaburra, Kingfisher and Crocodile (4), one particularly mean looking dude who, we were advised, had never been argued with in at least the last fifty years! 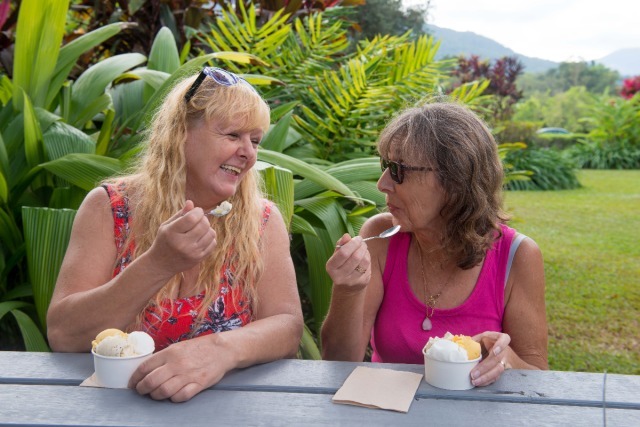 On land we enjoyed the exotic fruits of Tropical North Queensland and Billy Tea at Cape Tribulation, hand fed Wallaby and Kangaroo and were treated to a brief glimpse of a Cassowary, truly a day to remember. 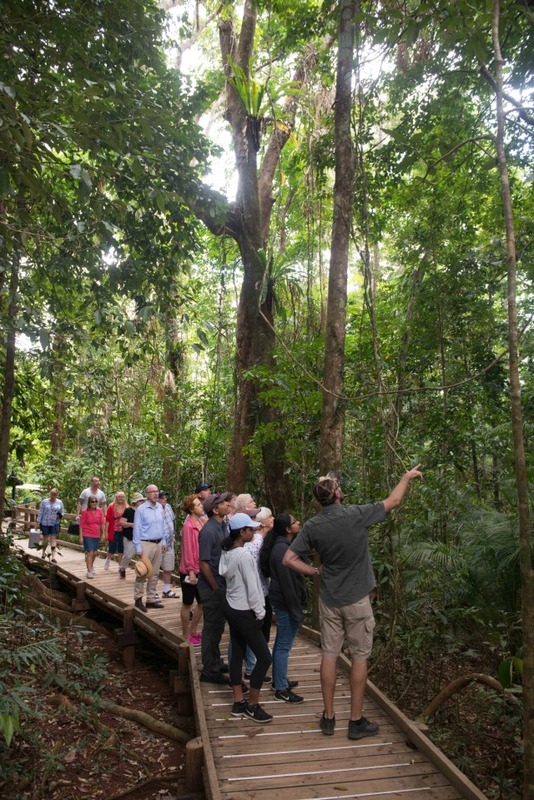 the tour operator was knowledgeable on all aspects of the rainforest making it a trip well worth doing. A thoroughly enjoyable day. The guide was both amusing and informative. we could not have asked for a better infomed guide. Fin was fantastic. He was someone who enjoyed his job and enjoyed showing and telling everyone about the area. Very exciting to see a cassowary in the wild. Excellent - Very enjoyable day. Rained all day but still able to complete most of the activities - worked around the weather. Very enjoyable trip, and saw a lot of beautiful scenery. 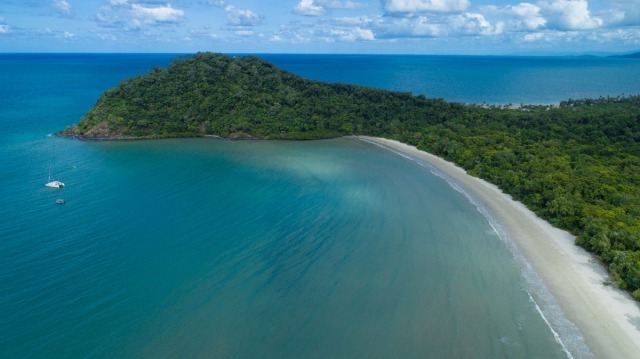 Would have preferred to have spent more time at Cape Tribulation and cut down lunch time. The air conditiner seemed to struggle in the humid conditions. This adventure was one of the highlights of our holiday. 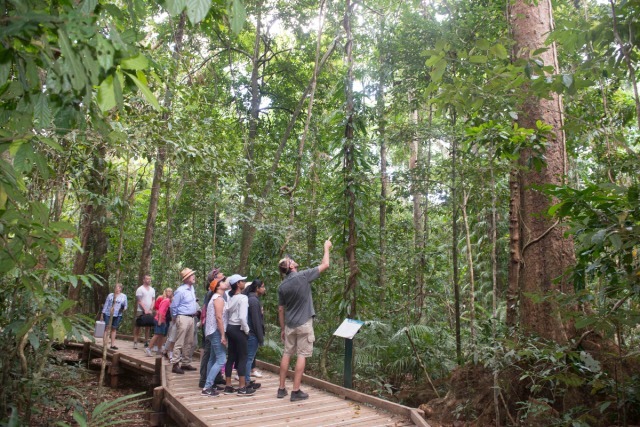 Matthew of the tour guide was very knowledgeable about the various plant life in the Daintree/Cape Tribulation area. 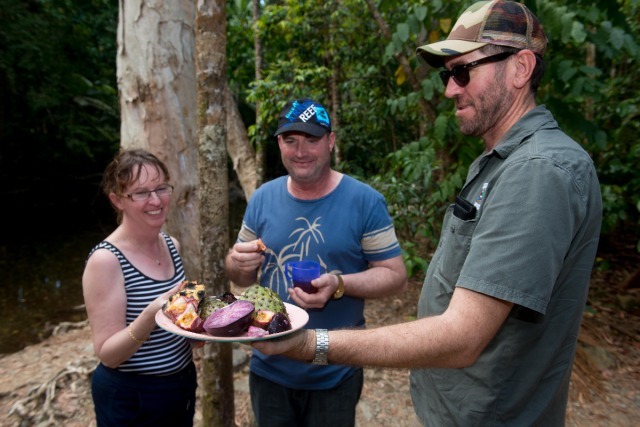 The fruit they prepared in the middle of Daintree area was absolutely beautiful and tasty. Andrew had a lot of knowledge about the area and the local wild life and plants etc. Andrew was very good. Full of information enjoyed it very much. The tour guide,John,was fantastic. He was very informative and had a great sense of humour and it was a fantastic day. Absolutely loved the whole day and our guide was knowledgeable, friendly and fun. Everything was perfect. Many thanks especially to our guide Matthew. we had a great time.Mat was an excellent tour guide. With really good local knowledge this is not a critism but to much food towards the end of the day. 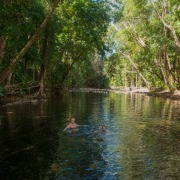 A great day out - very knowledgeable staff - and a great swim in the rain forest. Pick up on time, beautiful seaview, informative rainforest guide, managed to see some junior crocs during the cruise. 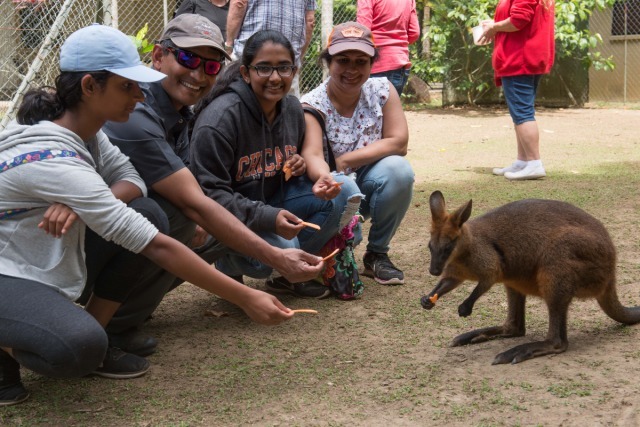 Kids love feeding the kangaroos and hugging the koalas. One shortcoming though, the BBQ steak for lunch were only meant for adults, kids were told to have only the sausages?! Extremely happy with everything. Highly recemend your service to all. kind regards Doug Sparkes Wonderful personal service. Great trip and heaps of information on the day - well done! A great day out - our guide was really well informed and interesting. We loved the whole experience. Fantastic, defintely one of the trip highlights. Guide was fun and knowledgable and the pace of the tour was perfect. I would recommend this tour to anyone. Excellent day trip. Andrew & John (the drivers) were extremely friendly and informative. An outstanding tour. Andrew, our naturalist guide, shared so many bush stories and tips and seemed to have an answer to every question. 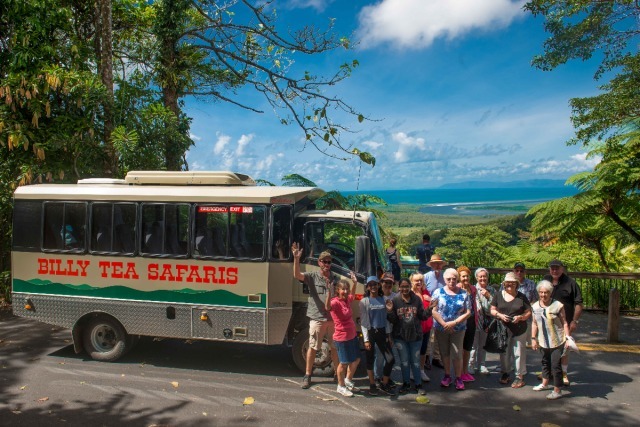 The safari bus was unreal and we really enjoyed having a swim at Cape Tribulation, tasting the yummy exotic fruits and billy tea, and definately the Daintree River Cruise where we spotted three crocs and two snakes! An unforgetable experience. Tour guide was very good and gave us lots of information about the area. Hi again - just got back from the Billy Bush Safari and it was very nice.The tour was a good mix of different experiences and the guide was quite knowledgeable. I enjoyed the Billy Tea Safari. 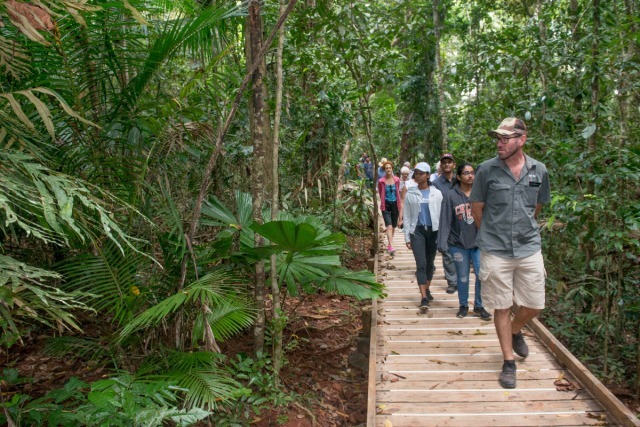 The best part was when our guide took us on the walk through the Rainforest and was able to point out plants and animals. 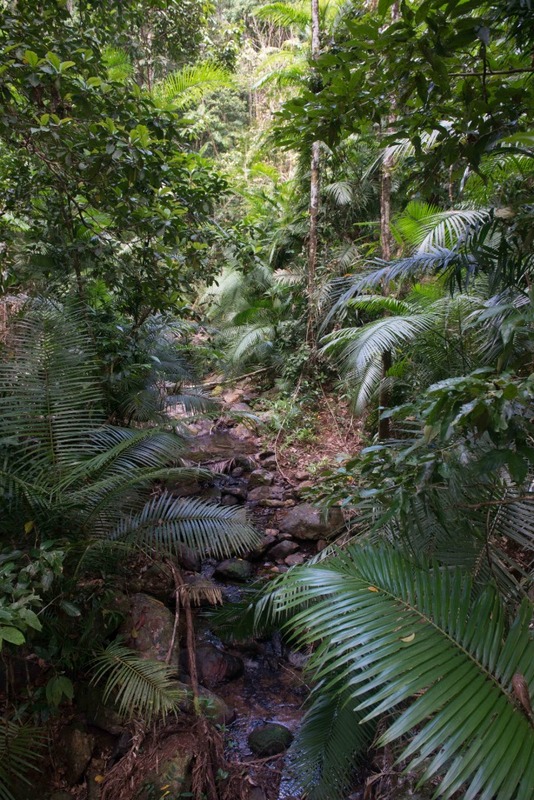 This was exactly what I wanted: details about why this Rainforest is so special. The lunch, fruit, and ice cream were great. A very enjoyable trip. A great trip. Guides were excellent. The guide is very knowledgable, friendly. We learnt allow from him on the Rainforest in Australia. Loved this trip very well organised. Never a dull moment. We loved the walk thruogh the Dantree Rain Forrest. The food was good and the trip up the river. The best bit was the swim in the fresh water creak. Brilliant Day. The Tour guide was excellant great day all round. The food was excellent. Fabulous day out. Had a wonderful time and will remember it for many years to come. Smaller groups , so a more personal experience. Our guide was brilliant . Enjoyed every minute. Very professional team. A great experience from the time of pickup until being dropped off after a very informative fun day. The afternoon tea by the riverside was wonderfull. We could not have had a more wonderful day. Our guide Mathew was a pleasure to be with and an excellent knowledgeable guide. 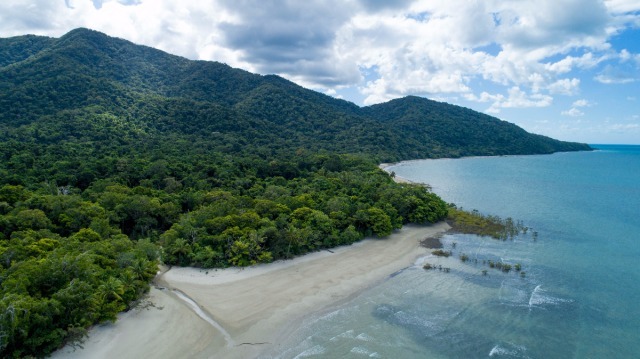 The rainforest and Cape Tribulation were more beautiful than we could have imagined. It was a full, fabulous day. Very enjoyable day out, it was a very wet day, but we still enjoyed. we were looked after realy well and I would do the same one again when we come back. Nothing was a problem for them and I will be telling all my friends about it! Just letting you know we had a fantastic time on our tour with Billy Tea Bush Safaris. I would definitely recommend this tour to other tourists. Our tour guide Ron was incredibly informative (and funny) and it was a great experience, the hi-light of our trip to Port Douglas. 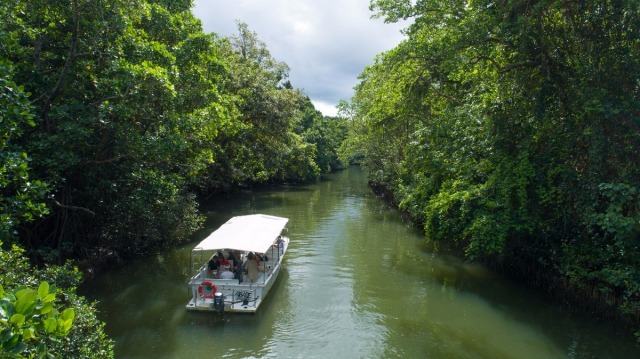 A great way to see the Daintree. A very knowledgeable guide. The swim in Emmagen Creek was a definate highlight. 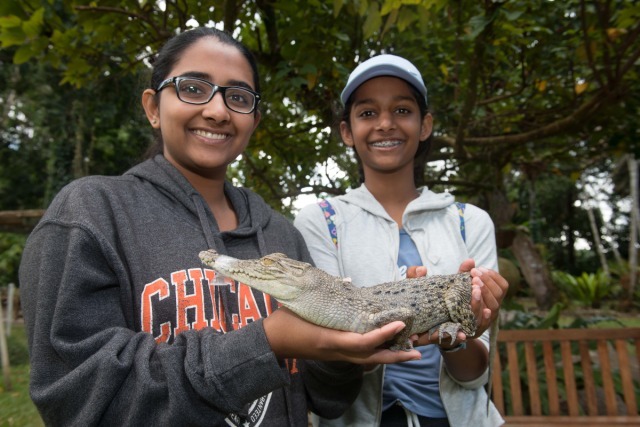 We were lucky enough to see a crocodile and a cassawary which is rare. The driver was good fun. I had a great time. It was better than a trip to the zoo as we saw the critters in their natural habitats. We saw a crocodile at the beach at Cape Tribulation - He opened his mouth and hissed at us. The kids enjoyed feeding the kangaroos. It was a good trip for all ages. Very enjoyable however it was difficult for anyone not sitting at a window seat to see the scenery from the vehicle. Great driver, good commentaries. Small group numbers and sensible drive/rest periods - most impressed all round. The whole day was memorable. Fantastic day, our guide Chris was brilliant, he knew a lot about the area and life style of the people and wild life and flora of the Tropics. Well worth the money.